Most of the constellations we see can be located from moderate light polluted skies. If you are new to astronomy, this is a good way to study the constellations which are highlighted for the most part by bright stars. Once you move to the dark countryside on a moonless night, standing under two thousand stars can be overwhelming. However when it comes to Canis Major, the brightest star in the entire sky called Sirius will easily guide you to this constellation. Mythology states Canis Major is one of the two hunting dogs of Orion the Hunter. Commonly referred as the “Dog Star”, Sirius is spectral type “A” star the second closest star to our Sun. 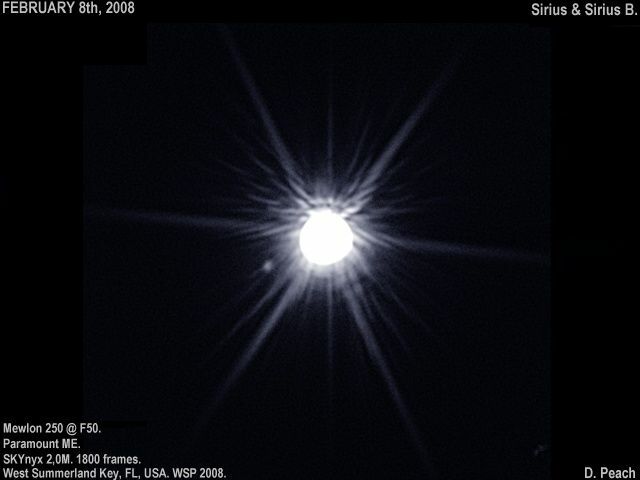 Located 8.6 light years away, Sirius is a magnitude -1.46 with a surface temperature a little less than 10,000 K.
Sirius has a tiny white dwarf companion named Sirius B also know as “the pup” and is extremely close. In Its 50 year orbit, magnitude 8.4 Sirius B swings as close as 8 astronomical units (au) and as far as 30 au. Being 10,000 times fainter than Sirius, seeing the companion will be a challenge. I first saw this pair in 1982. One of the best open star clusters in the area is M41. Located four degrees south of Sirius, M41 is a lovely splash of distant suns. It resides 2,300 ly away and measures some 25 ly across. At magnitude 4.5 it is a wonderful object in binoculars as well as low powered telescopes. Some 25 bright stars with many fainter ones exist in an area a little larger than the size of the full Moon (half a degree) or the width of your pinkie nail stretched out at arm’s length. Located between Sirius and M41 is a 13th magnitude galaxy NGC 2283. This challenging face-on spiral target measures 3.7 x 2.8 arc minutes in size. Located 32 million light years away, the galaxy is nicely placed amongst the foreground star field on the Milky Way. We will next look northeast where we find a lovely cluster in the constellation Puppis. M46 is a large, bright and rich group of about 500 stars. This 5,000 light year cluster seems to be harbouring a planetary nebula. This is NGC 2438, the death of a red giant star that is not part of the cluster. It is a foreground object some 2,000 light years closer. Even though not related, this makes a striking object to image. 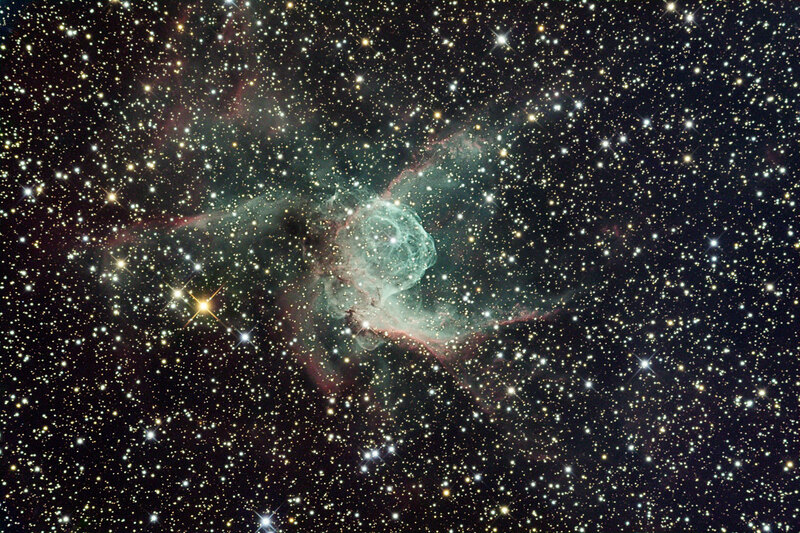 Move your scope six degrees to the west till you come across Thor’s Helmet. Catalogued as NGC 2359 we are looking at a 30 light year wide bubble comprised of a reflection and emission nebula. Thor is located almost 12,000 light years away and has an apparent magnitude of 11.0. The first meteor shower of 2018 will be the Quadrantids. This shower is a product of asteroid 2003 EH. The Quadrantids can produce as many as 120 meteors per hour like the Geminids last month but with a short 6 hour window, this is not a reliable shower. This year’s display is predicted to peak at 21 hours UT on the night of January 3/4 but the moon will be an issue this year. The so-called “super moon” two nights prior will greatly interfere with this year’s meteor shower. On the 3rd the Earth will reach its closest point to the Sun (perihelion) at 147.1 million km. As for planets, Jupiter is still the beacon in the east before sunrise. On January 1 there will be a nice line up of Jupiter, the star Zubenelgenubi, Mars and the star Spica. Over the next week follow Mars as it moves closer to Jupiter and overtakes the giant planet on the 7th with a separation of 0.2 degrees. Two full moons occur this month. The first will be the full Wolf Moon on the night of January 1. A full moon on New Years happened about once every 30 years. This is the closest full moon of the 2018 and will produce high tides. At the end of the month we have the full Snow Moon on the 31st. This second full moon of the same month is the Blue Moon. This night also has a special treat as most of North America will witness a total lunar eclipse to some extent. This eclipse favours the west coast. All times are local. Partial eclipse begins at: 6:48 a.m. 5:48 a.m. 4:48 a.m. 3:48 a.m.
Total eclipse begins at: Already set 6:52 a.m. 5:52 a.m. 4:52 a.m. Greatest eclipse at: Already set Already set 6:30 a.m. 5:30 a.m.
Total eclipse ends at: Already set Already set 7:08 a.m. 6:08 a.m. Partial eclipse ends at: Already set Already set Already set 7:11 a.m.
January’s new moon occurs on the 16th.